I burned out my existing motors I believe and I got some new kysan motors. 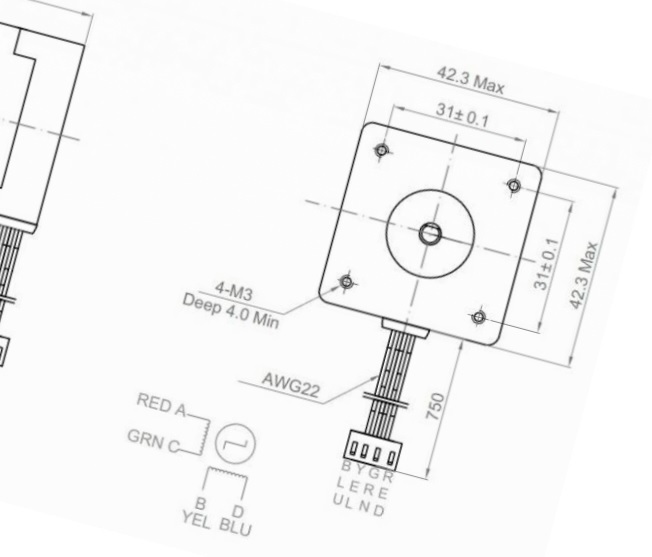 I've seen the wiring on the forum for getting the wires crossed for the Y axis but my still dont mesh. I have red green yellow and blue on the motors and red gray yellow green on the controller wires. the motor still fight each other. 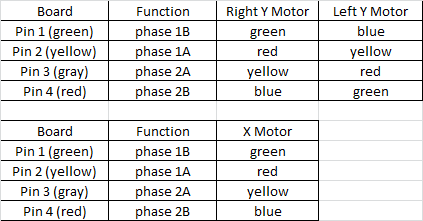 I think thats because green and yellow are pairs on the board but the green and red are pairs on the motor. but that doesnt give me direction and which way they go. anyone have experience on this? in this case the wire colors are not going to help you. If the OP's wire colors are not the same as the traditional ones, the only method that will work is to trace out each wire for position rather than color. This is all I can offer. If you look at it closely you will see that the wire order for one of the Y motors is simply the opposite of that for the other one despite the colors being the same at the motor ends. The middle wire pair crossovers and the wire reversals MUST happen after the junction splice (motor-side) for this to happen. BTW, if mis-wired, it would be unlikely (but not impossible) that the motors would have fried. Far more likely is that the step sticks would have been fried. They are the weak links in the chain. Thank you all, I was indisposed, I dont have the wiring as above there is no "plug in" just a group of wires coming out of the motor. Which is the forward wires i'd have to pair? If the motors run backwards, either reverse the order of the wires at the board connector or change it in the firmware (easier to do). If nothing else it shouldn't harm anything if wired this way because the phases would not be cross-connected. That helped thank you it is working now...YEAH..you guys are awesome!!!! I am in the process of wiring my recently acquired FT-5r2 and have hit a snag. I don't know how to connect the Y steppers. The MKS board end of the cables received from Folger are wired differently from the schematic in the manual and the posting made by Ron. The image shows the wires in the board connector starting from the left as Green, Yellow, Gray and Red. The cable has Green, Black, Yellow and Red. If we assume the Gray and Black are the same, then the Black(Grey) and Yellow are reversed going into the connector. The directions on page 69 of the manual seem to match the cable. I'm concerned about the apparent discrepancy. Which is correct? That will at least let you know the order of those particular steppers. On the diagram blow it up and print it if you can and mark down what colors you have for what pins they go to. one thing to note is there is NO WIRING STANDARD they can be any color, what matters is what pins they need to go in, I've seen Hot green and white wires! It's a real PITA I know, took me a solid half hour to splice the Y motors just so the first time was the last time. 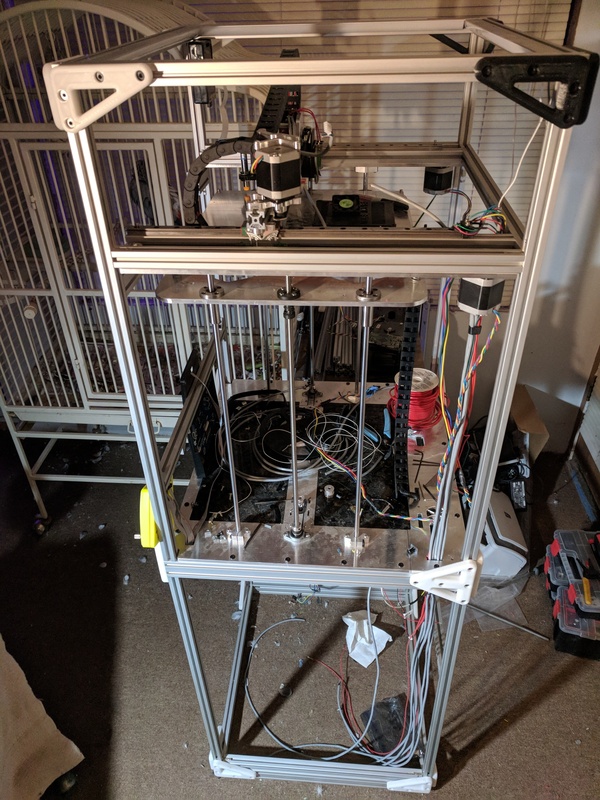 When you first activate a stepper, cover the power switch and be ready if you hear buzzing, instead of movement, DO NOT unplug a stepper on a powered on machine. I assure you that the diagram I posted above is correct (I have been running my printer that way for almost two years). However, as @Wyvern said, there is no wire color standard for these motors. You could have any colors in any order. Sorry. I have always said (and still say) that FT should supply the Y motor harnesses pre-wired. You must go by the connection paths as shown, not merely by color. Trace the wires carefully from point to point regardless of color to ensure they are connected in the order shown. Agreed, to that, however, it would take some labor to do that, and God forbid there is a supply anomaly and the wiring is different and they send out a whole batch of machines with the incorrect wiring. So in a business perspective, they probably are not going to do that. The less you do, the less you are responsible for. 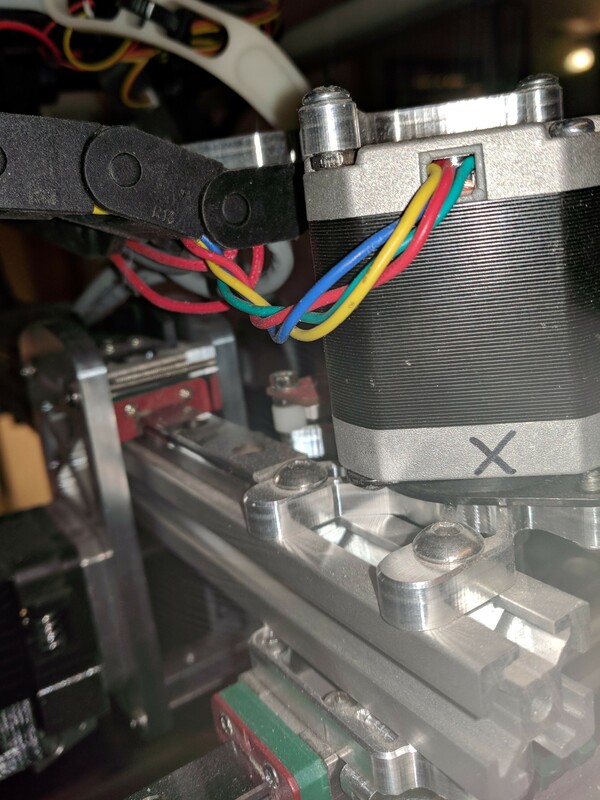 The X wiring on the FT-6 (which is rotated 90 degrees from the FT-5 so it would be the Y on the FT-5) has a PCB to link the 2 steppers correctly using simple plugs. Once we get out from under the FT-6, which I feel it's weight on my head, there will be update kits, an update to the current kit, or both coming to the FT-5. The wiring of the FT-6 is so much simpler, I can't wait for those updates to come to the FT-5. this might be irrelevant in the meantime, but I would suggest you to use two separat stepper driver for the Y-motors (the Y and E1 output, if you don't have plans to use a second extruder anyway). 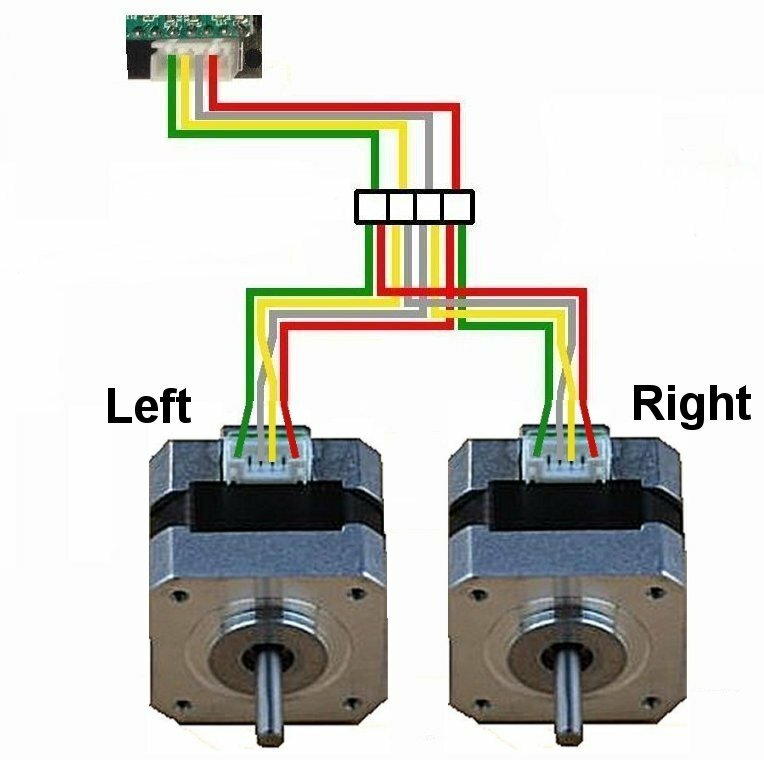 You will have the following benefits: no cable modification needed, you can use 2 cables as they are - directly from one output to one motor each. But the best: you will not get problems with motor stalling at higher speeds. My FT5 used to stall at Y speeds around 120mm/s. That wasn't the case for the X axis, what I was wondering about... It turned out, that parallel wired motors have stall-effects at resonance freqency. Now, as I drive the motors separatly, no stalling appears at all (speed range 10 to 300mm/s). Of course, the Marlin software has to be configured for dual Y output, but this isn't that tricky. Let me know, if you need more info.